Turn a plain woman's sweatshirt into a fashionable jacket by embellishing it with your scrap yarn. 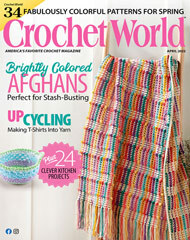 This e-pattern was originally published in Scrap Cochet! Size: Your purchased sweatshirt. Edging: 1 1/2" wide when sewn in place. Made with fine (sport) weight yarn and size H (5mm) hook.